We're feeling rather spring-like at the moment, really it is hard not to in this beautiful weather. 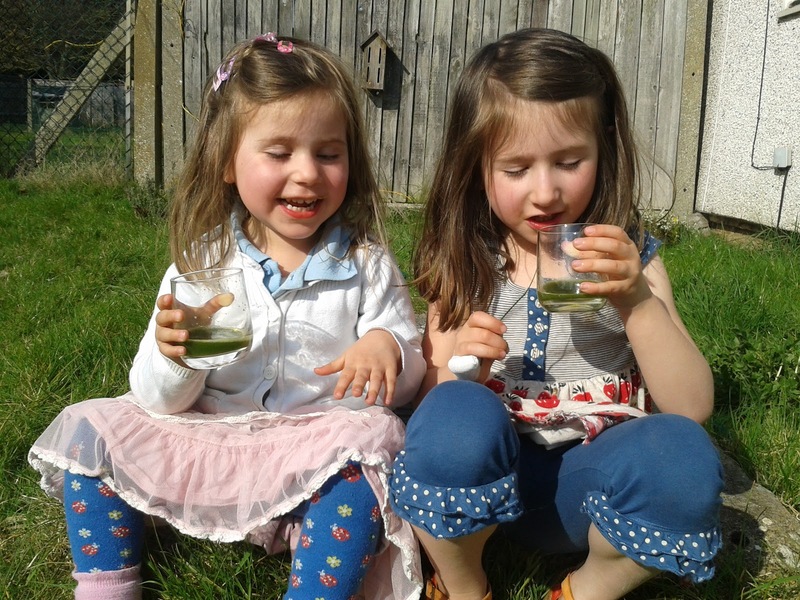 I have been waking up to birdsong in the mornings, there are gorgeous flowers popping up all over the garden and we have had our first visit from a butterfly yesterday, much to the girls' delight! This is a time of great change in nature and there has been a lot of change for us too. 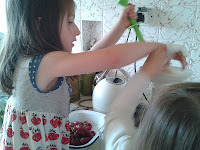 Last week was Fia's last day at school - we have opted to home educate her and will be using Steiner kindergarten methods as a guide. I am so excited by this, we have had an amazing start so far and am enjoying this extra time with both the girls. I am sure there will be plenty of days when it is a challenge for us, but for right now, it is flowing so easily I am wondering what took us so long to do this! 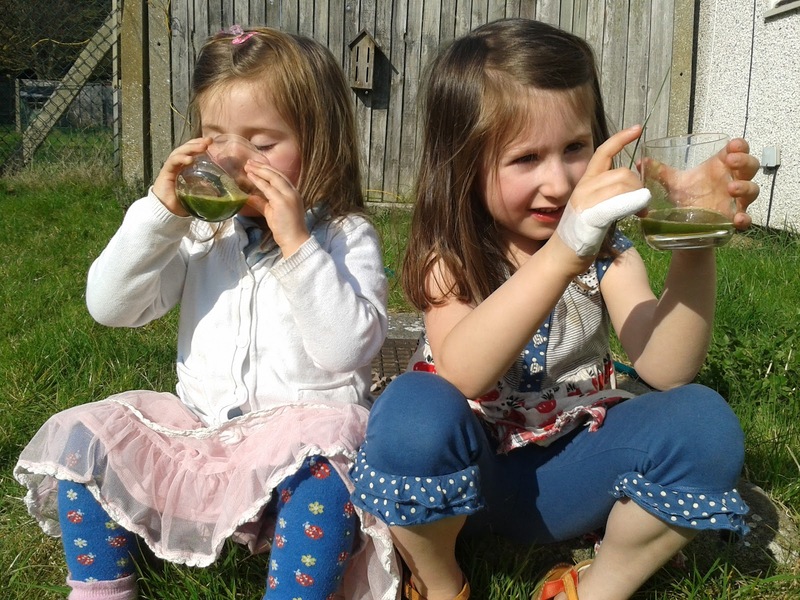 One thing we have been doing this week is a lot of cooking (naturally), but the past couple of days we have been mostly making nut and seed milks and juices. 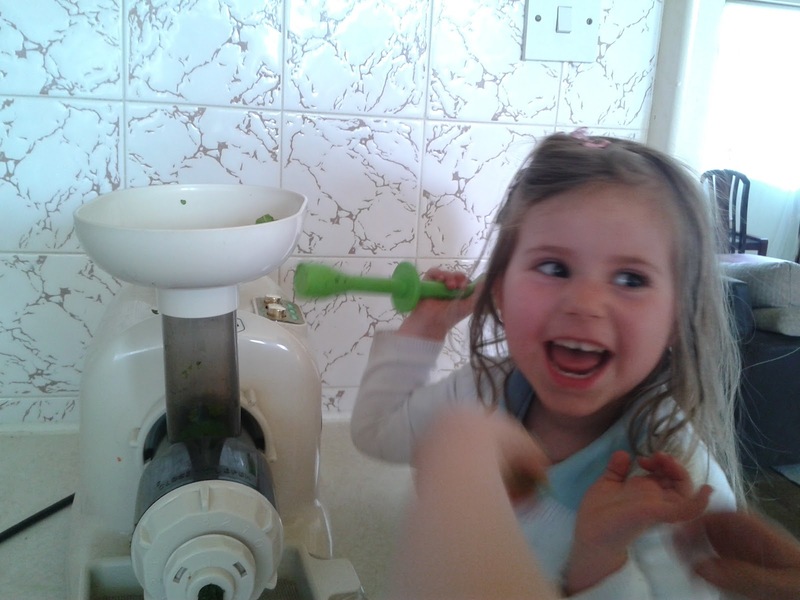 Making juices is such a great way of getting children excited in the kitchen- they love choosing ingredients to make up their juice, and they always seem delighted with the whole process of turning the fruit and veggies into liquid. Juices are great this time of year, on warm days it seems we all crave the freshness and simplicity of this food, I have never seen the girls drink down green juice as they did yesterday, it was a big hit! So in honour of spring, family and all things new, I am going to share this simple and delicious triumph of a juice: red grape and butterhead lettuce! 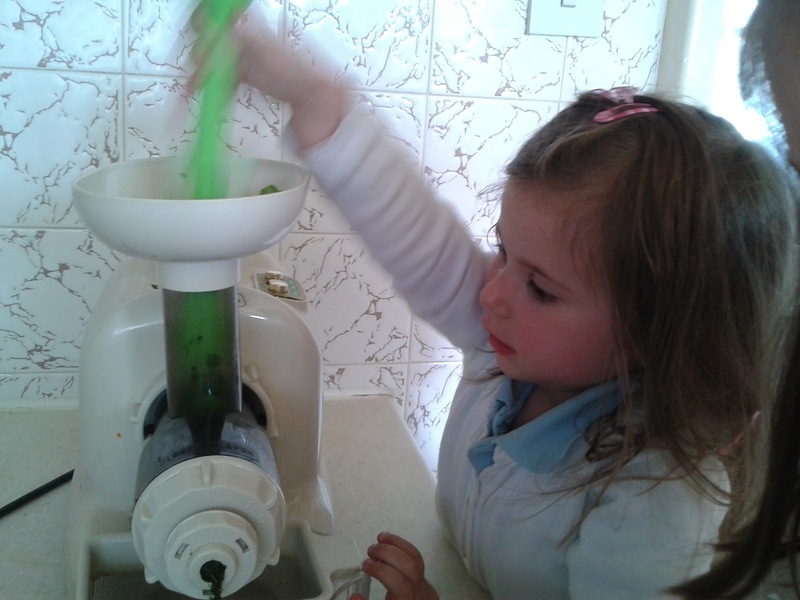 Put them all through your juicer and enjoy immediately! *UPDATE APRIL 2016!! I promise I am working on the vegan version of this cake- it's nearly ready, will update soon! We have enjoyed such a beautiful weekend with glorious weather, glorious food and glorious company! 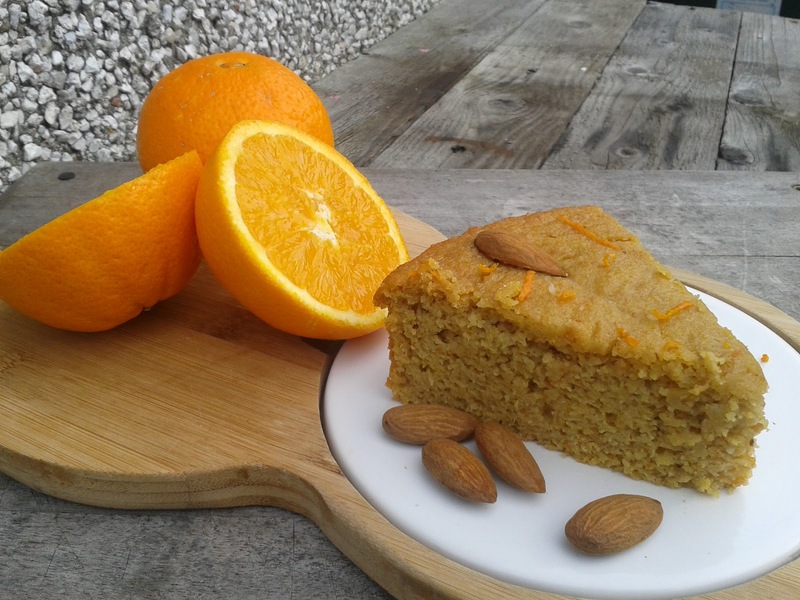 Having friends over gave me the perfect excuse to remake a cake that I had made for Wills birthday at the start of this month- Spanish almond and orange cake. I first discovered this amazing cake while trying to decide what to make for Will's birthday. Spanish polenta cake came to mind right away, but all the recipes I could find had a lot of butter and sugar, and without a ton of time to experiment with the cake, I wanted a recipe that didn't need too much adapting. In the end I did a google search and found an AMAZING Spanish blood orange and almond cake, which was already so brilliant, I could pretty much make the cake from recipe with only a couple of tweaks! The original recipe can be found here on this rather inspirational blog called 'a little bit of Spain in Iowa'- I will be checking in on this blog frequently, not only does it have great recipes, but the blog posts are very cool to read, I really enjoyed browsing them. As I mentioned before, the changes I made were pretty minor. I left out the almond extract, swapped baking powder for bicarb and cream of tartar (I like to make my rising agents but a good quality baking powder is fine), used maple syrup instead of honey on Wills cake, (cause we were out of honey- though I used honey in this weekends version), and swapped half the wholemeal flour for polenta to give an extra taste of the Mediterranean! Anyways, it turned out beautifully, it is easily the tastiest cake I have ever eaten (and I'm not exaggerating!) The texture is so moist and melts in your mouth, it is almost 'moussey' in fact. During the cooking process the scent is so very fragrant that we could smell it from the garden, it made our whole house smell delicious! If you have an occasion to celebrate, I really recommend trying this out, you won't be disappointed. First of all, wash the oranges and prick them with a knife. Pop them in a pan and cover with water, bring to the boil and simmer on the hob for around an hour until the skins feel soft. Take the oranges out and leave to cool for 10 mins. Cut them in half, remove and pips and blend them in the food processor until you have a smooth orange puree. Set this aside. In a large bowl, whisk together the eggs, oil, honey or maple syrup and vanilla until well combined. Add the almonds, bicarb and cream of tartar, spelt and polenta and combine carefully. Next, fold in the orange puree. Pour this into a 20cm greased cake tin and bake in the oven for around 40mins, until a cocktail stick inserted into the centre comes out clean. Cool in the pan on a wire rack for 10 mins, before turning out onto the rack to finish cooling. Today is SUCH a beautiful day; the sun is shining and not even a cloud in the sky, but, it's still early March and it is freezing out there! One thing I love about raw food fusion, is that you still get the warmth and comfort of hot food, which on days like this is soooo great, along with the freshness and nutrients of the raw to help put a spring in your step! I feel that this kind of eating is a lot more suited to our climate here in the UK than 100% raw, though that is a personal opinion as there are a lot of raw foodists here who thrive on all raw. This I think is the key, everyone is different, and the super great thing about this recipe, is that it is so flexible, it pretty much suits any person. I serve this sauce up on just about anything. 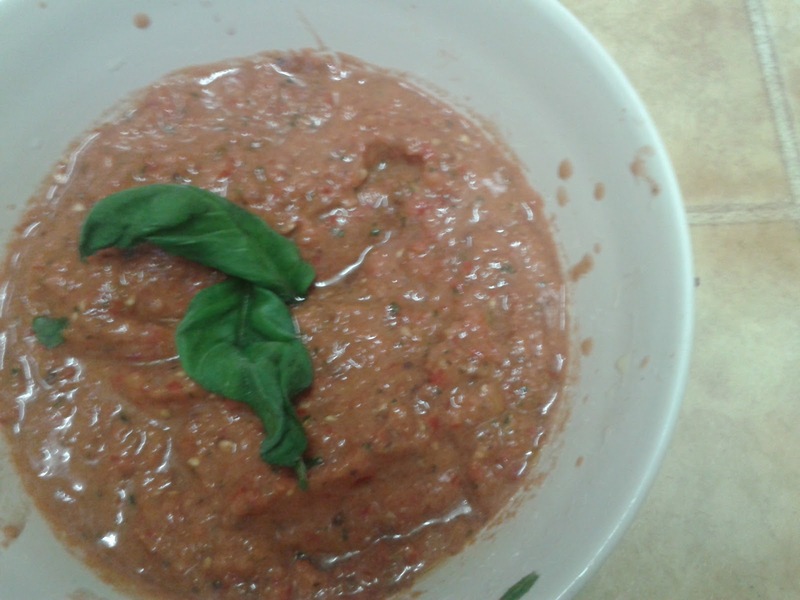 It is great on cooked wholemeal spaghetti (the girls adore this), raw courgette 'pasta', as a sauce over adzuki bean loaf, and even as a dressing to name but a few. 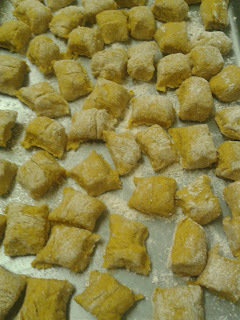 I love it best on gnocchi though, for me it is the perfect 'zingy' partner to those soft little dumplings. Making gnocchi with squash rather than potatoes is just another way of getting even more nutrition into the meal, as well as tasting good and looking very pretty and appealing. Gnocchi is traditionally made with an egg added, but I find this recipe works very well without it, making it a great vegan dish! It does make the dough a little more delicate though, so be gentle with it.....! Blitz everything together in a food processor till well combined, with a very slightly chunky texture to it. You can blitz it totally smooth in a blender if you prefer, but I think it is tastier with a bit of a bite left. That's it! It is so simple and tasty, we prefer it over a regular cooked pasta sauce. Roast the squash at 180 degrees for around 40 mins until soft. Remove from oven, cut in half and scoop out those seeds. (you can save the seeds if you like to roast, they are delicious sprinkled with sea salt and paprika). Leave to cool. When the squash is cool, scoop out the flesh, discarding the skin, and blitz in a food processor, or mash by hand until smooth. Turn out into a bowl. Season with the salt and nutmeg, then start gradually adding the flour, a couple of tablespoons at a time. This part is tricky and you need to rely on your judgement. 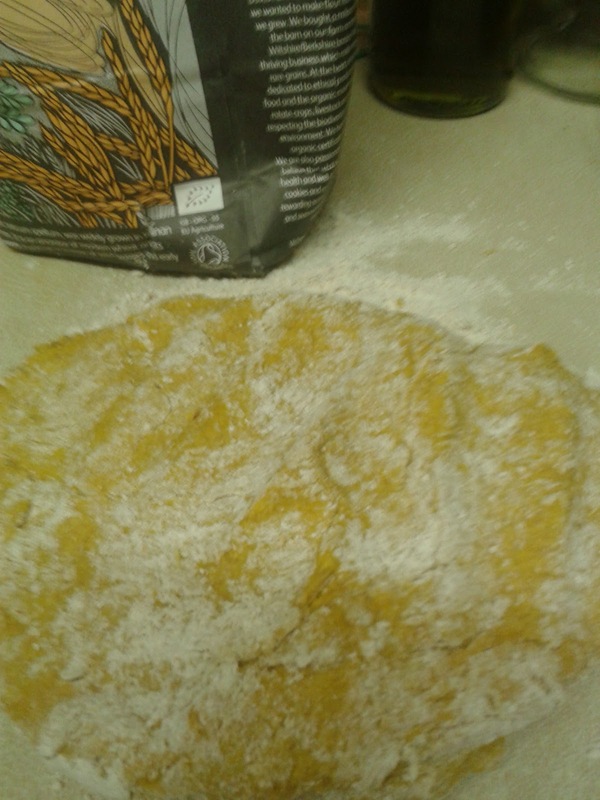 Depending on the size of the squash you used, and the moisture content, you may need more or less flour. What you are looking for is a very soft dough. It should hold together, but still feel airy, light and soft to the touch, it will feel very delicate- but that is exactly what you want, we aren't looking for rock hard dumplings! 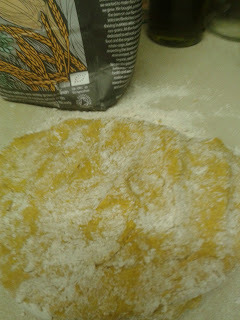 Turn the dough out onto a well floured surface. Cut it into quarters, and roll each quarter into a long sausage shape, about 3cm in diameter, keep the dough well coated in flour to stop it sticking. Next, cut it into little bite size pillows, about 2cm in length, pop them on a lightly floured tray as you go, to keep them from sticking, keep going until you have used all the dough. 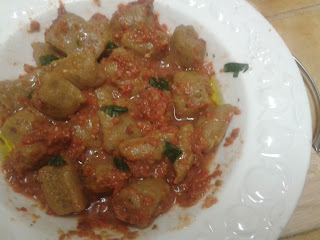 It is at this point, that if my Mother in Law were here, she would turn them into the most beautiful curved little gnocchi just by using a fork, but try as I might, I just can't get the hang of it, so mine remain as little pillows! Fill the largest pan you have with water and bring it to the boil, add a dash of extra virgin olive oil, to help stop the gnocchi sticking, then add the gnocchi to the pan with a slotted spoon. Don't add them all at once, you'll probably need to do around 3 batches. As the little dumplings float to the top, remove them with a slotted spoon, and place onto a dish which has a little of the raw pomadoro sauce on it. When all the gnocchi are cooked and dished up, pour the rest of the sauce over them, and you're ready to serve! 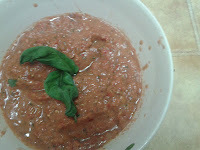 I like to serve this with a drizzle of extra virgin olive oil, lots of fresh ground black pepper and some torn up basil leaves.